Birdnets help reduce the loss of production caused by birds. Birdnets are a protection system that acts as a barrier against bird attack. In this article you will find out why birdnets are a necessary element for many crops. Besides humans, there are other organisms benefiting from the production of crops. For example birds are large consumers of fruits and seeds produced at the expense of farmer’s efforts. Birdnets can prevent birds from attacking crops. One of the most affected sectors by some type of birds because of their eating habits is the agricultural. One of the natural threats for crop fields are birds, which are responsible for the loss of large amounts of production. Farmers that have been seriously affected by this natural threat have chosen to work with another type of crop which causes a reduction in the production of a certain product. Farmers have used different methods to scare away birds and avoid the huge losses that they can provoke. The following examples are some of the methods to scare away birds and that reduce the loss of crop production: birdnets, reflecting objects, digital equipment, mobile repelling devices for birds, repellent gel, among others. Some of these methods have major disadvantages, for example mobile scarecrows and reflecting objects because birds can get used to them after a few weeks, lose their fear and continue to eat the fruits and seeds again. Bird protection meshes are better than other bird scaring methods because birds can get used to scarecrows, reflective objects and noises. One method that has proved to be very effective is the birdnet. This bird scaring system has great advantages since it works as a barrier preventing access to the crop or plant, plus it is harmless to birds. 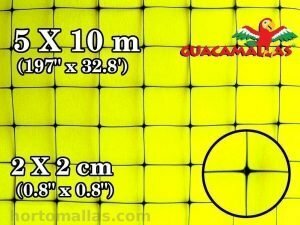 There are different ways to install this bird protection meshes; it all depends on the type of crop you want to protect. They can be installed directly over trees or trellises of fruit trees, covering the access to tunnels and greenhouses, or even to create separate structures such as when protecting sweet corn crop, hanging the bird protection mesh directly above the tensioning cables. Placed over fruit trees, the birdnet or bird protection mesh becomes 100% effective. Birdnets have the characteristic to adapt to different crops to protect them even those planted in trellises like berries or strawberries. They can be used to protect crops of seeds or fruits. In the case of shrubs or fruit trees, there are different ways to install them like covering the total area of cultivation. Another way to protect the crop is to install the birdnets for fruit trees covering each one of the units of the crop. Is it worth a year of work so that fruits are ruined by birds? Install bird and bat protection meshes instead. This birdnets allow farmers to continue planting the same type of crops without having the need to change them. HORTOMALLAS produces and promotes agricultural meshes (trellises, trellising and mesh barrier holder) that improve the quality of crops. Our mission: INCREASE PROFITABILITY OF CROPS THAT NEED TUTORING AND SUPPORT USING MESHES INSTEAD OF RAFFIA MANUALLY INSTALLED. Since 1994 we help farmers improve their crops of cucumbers, tomatoes, melons, pumpkins, beans, chilies, peppers and more vegetables that require trellises. HORTOMALLAS is a perfect system for cucurbits and solonaceas to have better phytosanitary conditions, increasing sun exposure and brix system. Apart from the obvious decrease in the cost of labor and agrochemicals, by using HORTOMALLAS you can extend the useful life of a plant, and there for allowing to reap more and better quality product. Contact us, our agronomists will provide expert advice and attention throughout Iberia and America.